All transactions are safe and secure with a reliable history in online purchasing behind each of our associates. 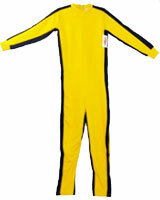 Buy the Bruce Lee Game of Death Costume to own Bruce Lee clothing and merchandise. Wear this full body Game of Death costume overtop of your favorite Bruce Lee shirt for the ultimate combination. Lee's classic yellow costume is easily recognized by Game of Death movie fans and admirers of the martial artist the world over. In the movie, Lee traverses the floors of a pagoda, where he eventually fights Kareem Abdul-Jabbar on the final floor. Add this stylish costume to your collection of Bruce Lee t-shirts and related clothing. In addition to the Bruce Lee Game of Death Costume above, browse the Bruce Lee Clothing Gallery for more apparel like men's and women's clothes, kids shirts or hoodies.